We are so fortunate every year to entice some brilliant children’s authors out to Brewongle to pass on their talents to the students. 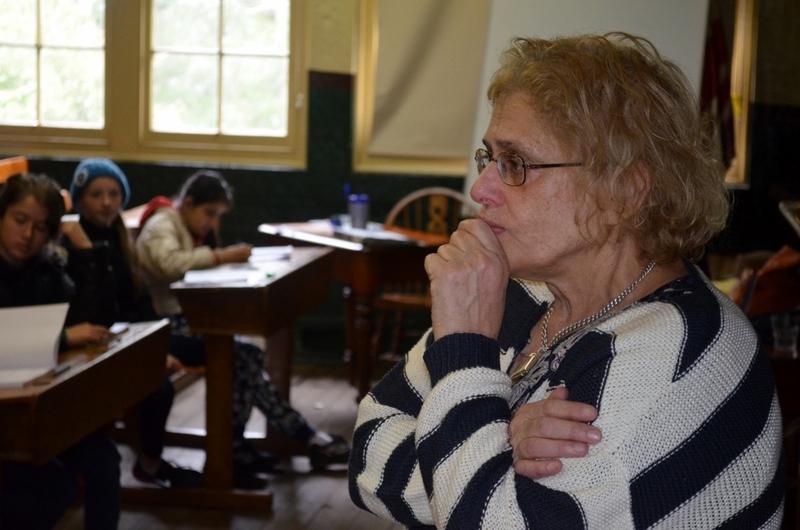 This year is no exception with Suzanne Gervay sharing her compassion, passion and exceptional skills in connecting with students during her workshops. Richard Tulloch last visited us three years ago and it is such a pleasure to have him back. He is a world traveller and apart from his excellent books he also writes a great blog that is well worth a read. Richard had the students madly writing and sharing in his workshop today. Pamela Freeman has also returned to Brewongle this year and the students were enjoying her expressive style and creating a story that involved a unicorn when I popped into the workshop for a look. Pamela also showcased her percussive talents during a music session at recess. This impromptu music session had us all clapping and tapping. Thanks to the students who joined in and tried out their guitar and drumming skills! The creativity was flowing into the evening of our annual Writers Camp. Our talented group of year six students created some “Fractured Fairytales” and performed them for everone’s amusement. We were so impressed with the acting talents of all these young writers. After much grinning and giggling, We devoured some supper and headed to cabins before the rain began. Many stories were told into the night – especially by the boys cabin, but most were snoring and dreaming by 11pm. This is very impressive for first night of camp! 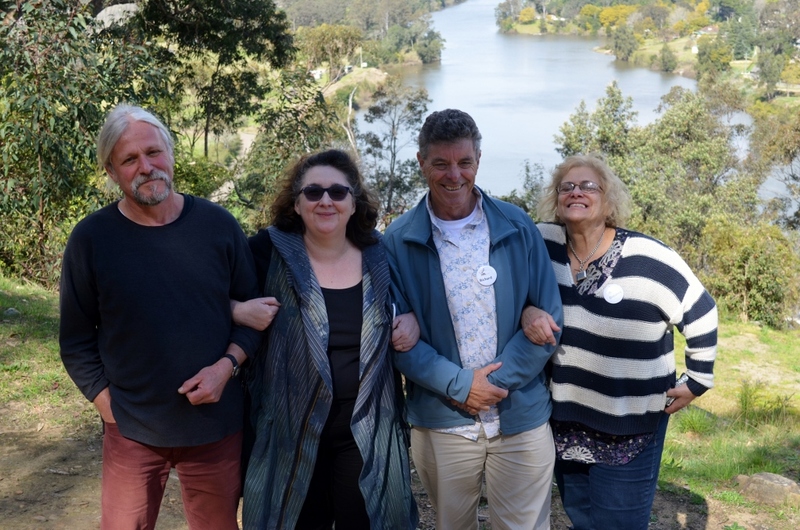 Enjoy the photos and there will be more to come – as Day 2 is our famous author day with Suzanne Gervay, Pamela Freeman and RIchard Tulloch. Even as I write, students are ensconced in workshops and soaking up the creativity! 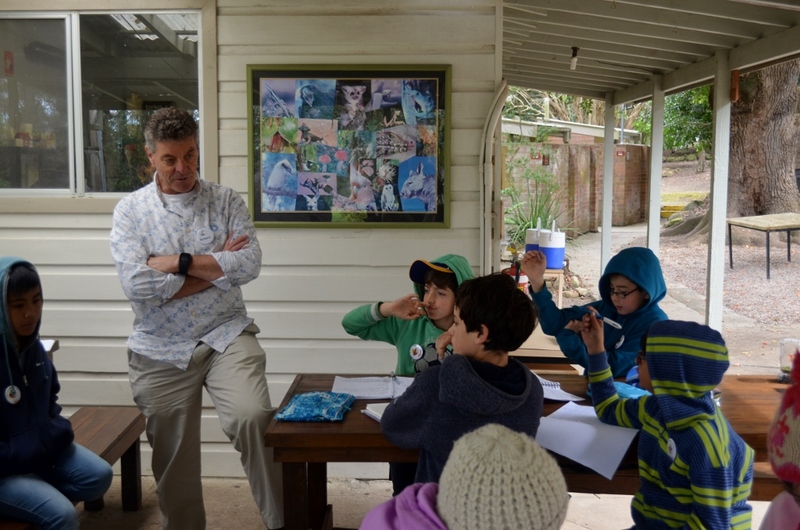 Our annual “Writers in the Environment Camp” for year 6 writers is into its 25th year and our 2015 students are in camp and busy exercising their creative juices already. We hope to have a few ‘Eco Mystery’ stories ready to publish on this blog by Friday as our young authors try to marry technology (iPads and iBooks) with their creative writing skills. Students are currently engaged in workshops with our Writer in Residence – Simon French. Simon has been to every one of the 25 Writers Camps and we are so grateful to him for supporting this camp and giving up his time to share his skills with the students. 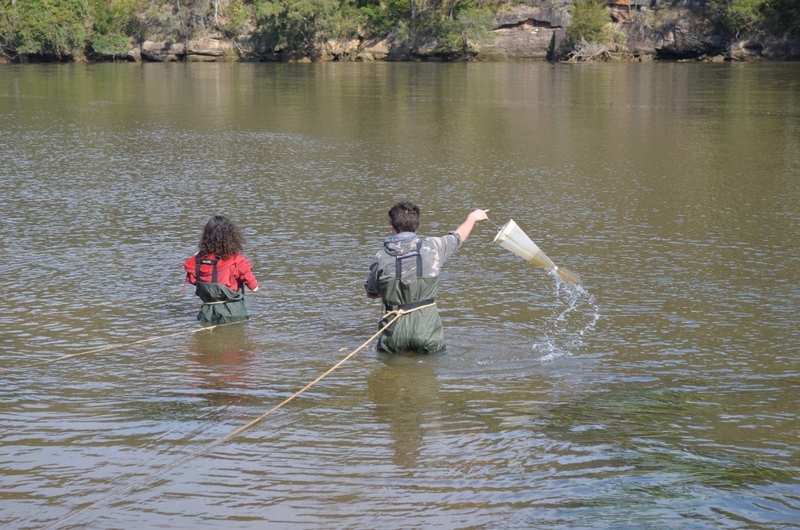 Danielle Chew from Barnier Public Schools is also leading the students on the path to creating an eco-mystery by Friday. We hope they are all up to the challenge! Our day begun with some ‘get to know you games’ that allowed students from so many different schools to begin forming some friendships and bonds. More updates to follow – so stay tuned! With great fanfare I would like to announce the inaugural “Schools who follow Brewongle’s blog photo competition”. The prizes will be huge (mmmmm…) and include free posting of your great shots on this blog…. One of my favourite blogs is written by an ex-lecturer of mine Ian Lunt. Last year he ran a competition of before and after ecological restoration photo’s. You can see the entries and winners here. This got me thinking on all the great sustainability and environmental projects that are happening in schools every year. I would love to see before and after photographs or videos of any environmental projects you have happening in your school. 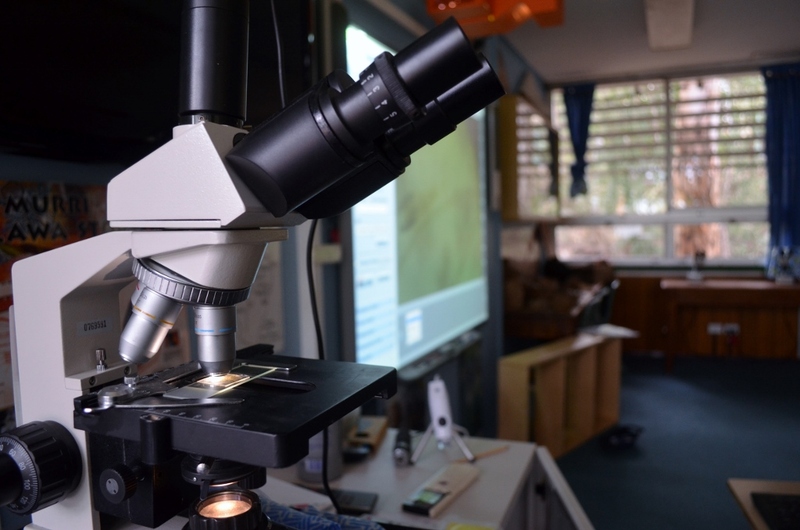 I know there are plenty out there – especially all those schools who have participated in Climate Clever Energy Savers with us over the past years. 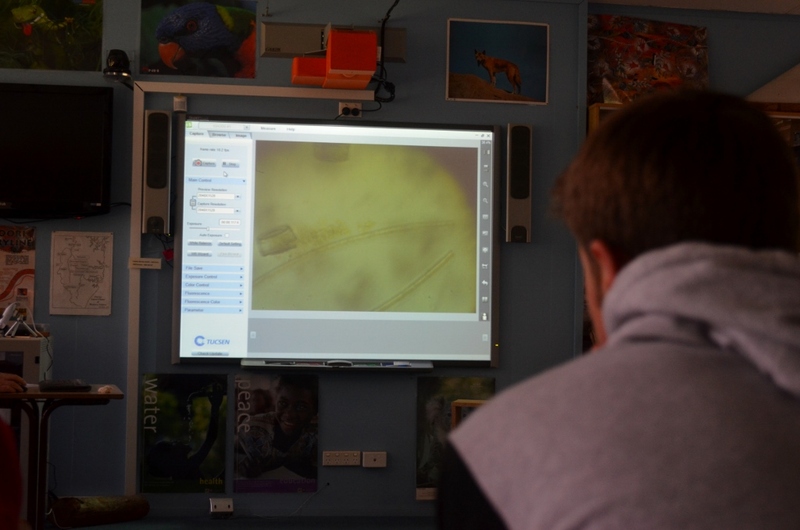 I have heard of school food gardens, bushland trails, bushtucker gardens, water recycling, bush regeneration, chicken pens, wetlands, bee hotels and many more in my discussions with teachers. I would love to showcase all these fantastic efforts by staff, students and parents on our website. To enter simply send me your before and after photo’s/videos of any project that you have completed or are working on. I will then publish them and if my computer skills are up to the task we will all vote on our favourites. Please include a short description of the project. There are very few rules and entry is open to all schools and education facilities – including our Environmental and Zoo Education Centres of course! Be proud of the achievements of your school and help us showcase them to the world! We are making a food forest! I just love working with soil. 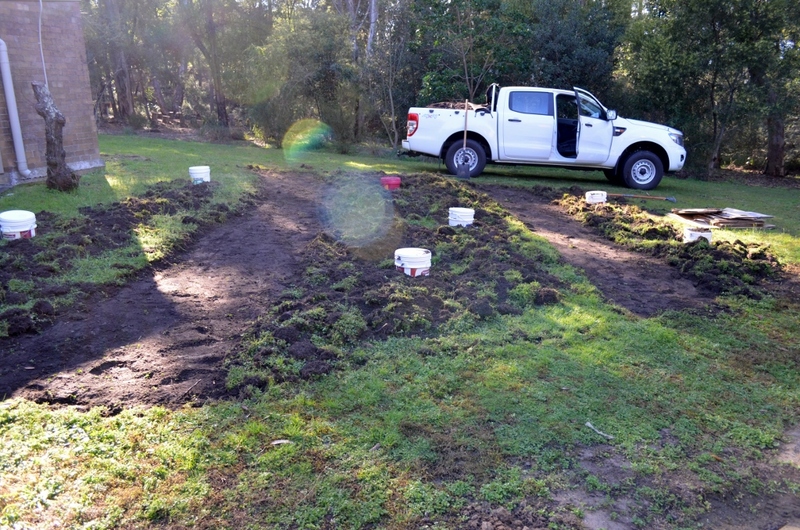 Digging, composting, mulching and growing are pretty special activities on a sunny, cool autumn day. A little while ago I completed a Permaculture Design Course which led me to complete a design for the lovely Brewongle EEC. You can read my plans if you are interested here. We are now beginning the journey of permaculture and putting plans into action! Stage one for us was addressing some water catchment issues by installing a new shining water tank. This water will help irrigate the new food forest gardens throughout our harsh summer. Stage 2 is to begin preparing the new garden beds that will eventually be a thriving food forest based around citrus and nut trees. The soil here is pretty good, but just a little sandy and lacking in organic matter. We also have some water run off problems that need to be addressed. By creating a swale (a depression before a raised garden bed) we can capture water and deliver it to the plant roots where it is needed the most. The swales will be mulched paths between each garden bed. These swales follow the natural contours to retain water in the landscape. We are trialling some worm towers that will deal with the plentiful amount of food scraps from visiting school groups. Using recycled plastic buckets from the local takeaway our soil will be further energised with worm compost. Place the towers in your garden, throw in a few worms and compost away! When full, pull out the bins and move to a new location. Easy! Each bed will be layered to improve the soil. First, all the grass dug out of the swale is dumped on the bed, then a layer of wet cardboard is placed over this to suppress the weeds. The existing grass will compost down nicely under this. Then we heap oodles of smelly mushroom compost and bed it down with a blanket of sugar cane mulch. This is essentially creating a great big composting garden bed that will be bursting with organic matter, worms and nutrients by the time we plant out in a couple of months. 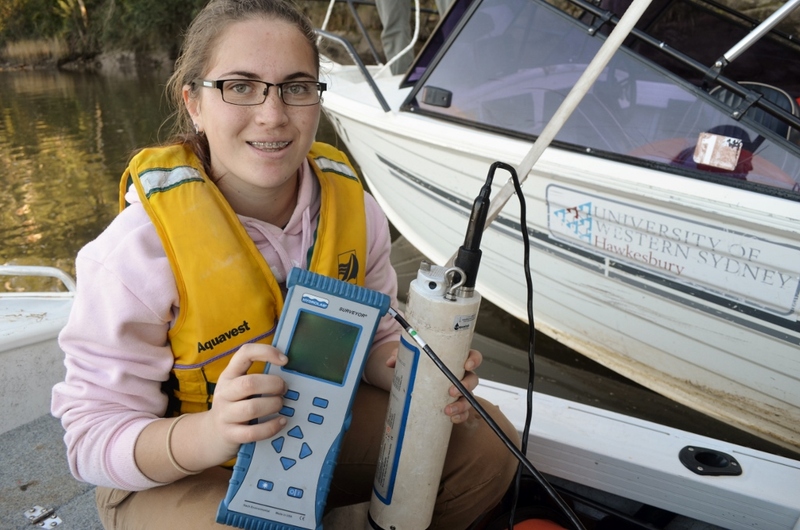 All this work has been made possible via a grant we received from the Primary Industries Education Foundation Australia (PIEFA). 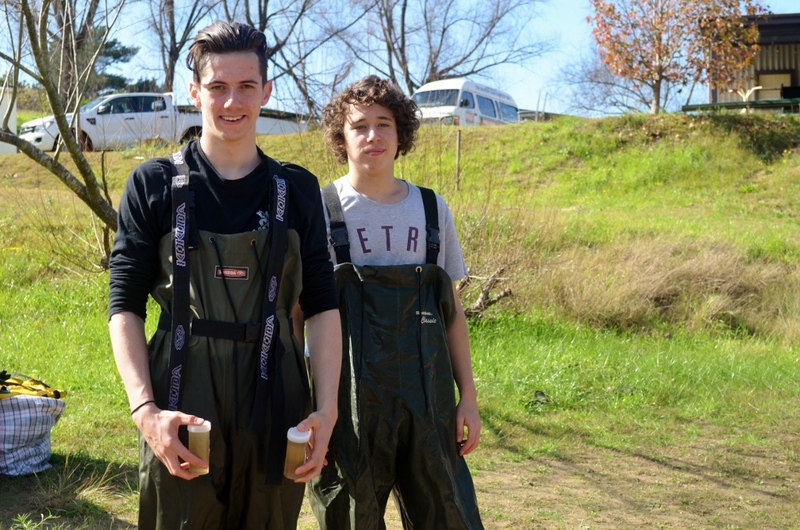 We are a now a Primezone Partner School with UWS Hawkesbury Campus and our new permaculture garden will form part of a teaching resource for stage 5 Agriculture. Stay tuned for further developments! Early this week we had a moving and special day. 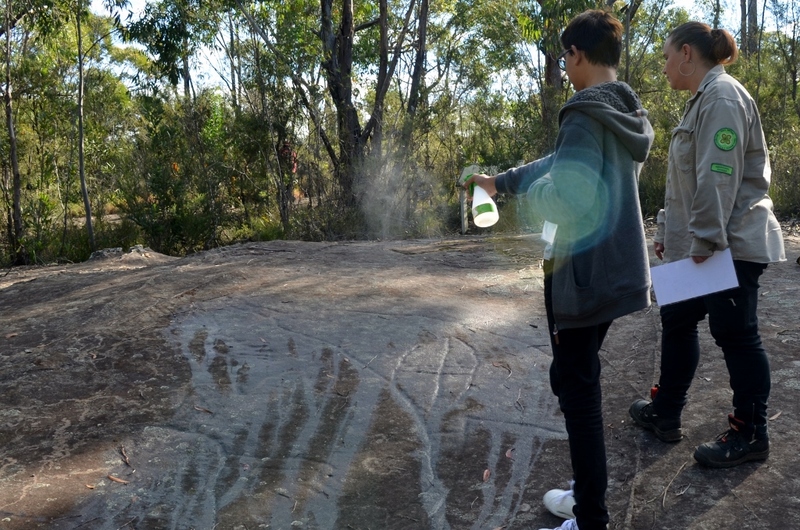 We journeyed with Aboriginal students and staff from Arthur Phillip HS, Blacktown Girls HS, St Clair HS and St Mary’s Senior to several rock art sites in the NW Sydney region. We offer thanks to the Darug Community and Elder Aunty Edna Watson for giving their permission to enter and view these sites. 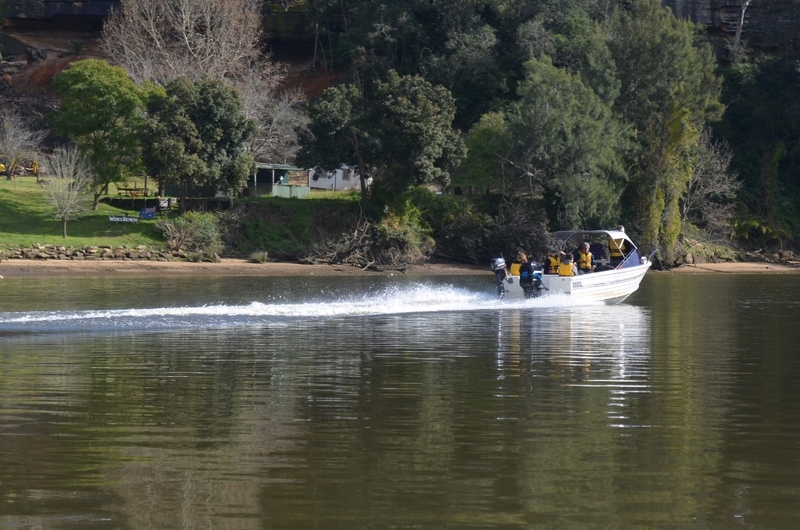 Our guide for the day was Erin Wilkins – Darug woman and Aboriginal Educator with Brewongle EEC and Muru Mittigar. Erin Wilkins and students discovering kangaroo and shield engraving. 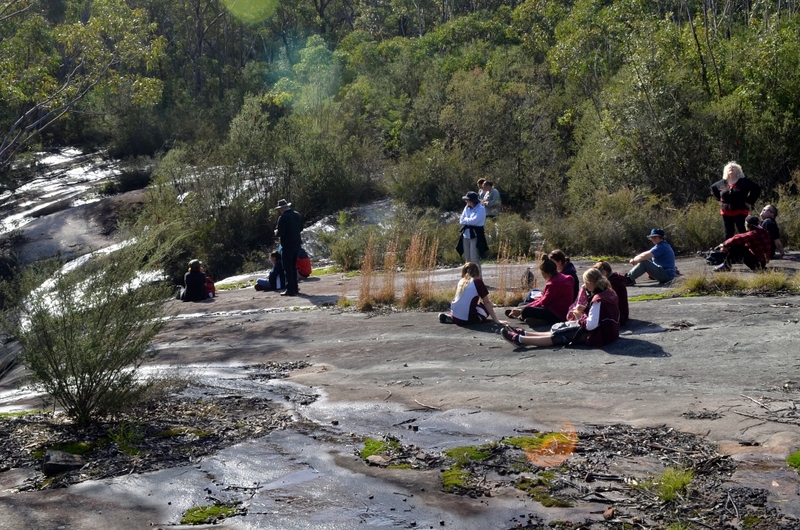 I can think of no better way to celebrate NAIDOC week in schools than to share some of this incredible heritage of the Sydney region with local students. It was profound event for us and we hope the students too. 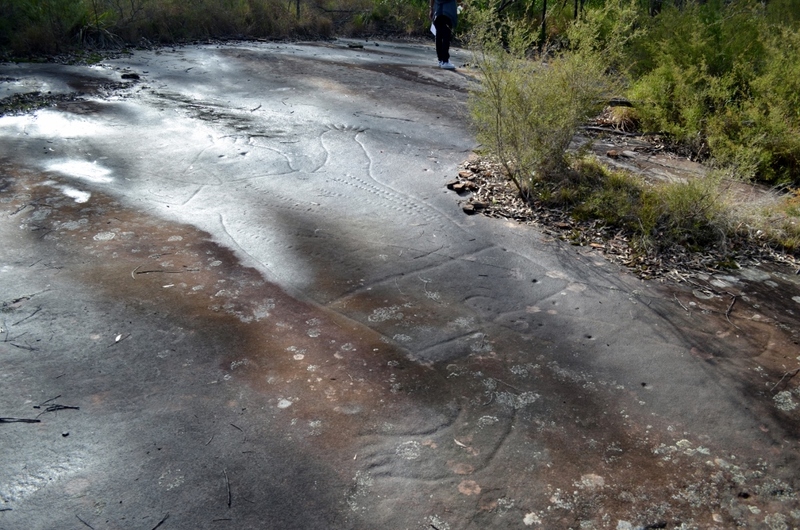 The sites we visited in Canoelands and Maroota are examples of the rich thousand year old sites that are all around us here in the Sydney basin. 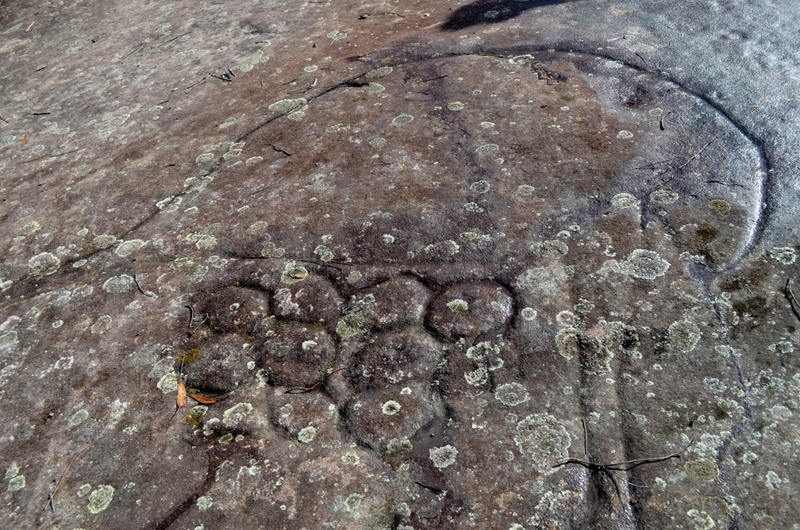 To me, a non-Aboriginal man – I was incredibly grateful to visit these sites and witness the power and a little of the way things were in this land for millenia past. Feelings of sadness and shame bubbled up for the destruction of culture and people that occurred in our tainted colonial past. 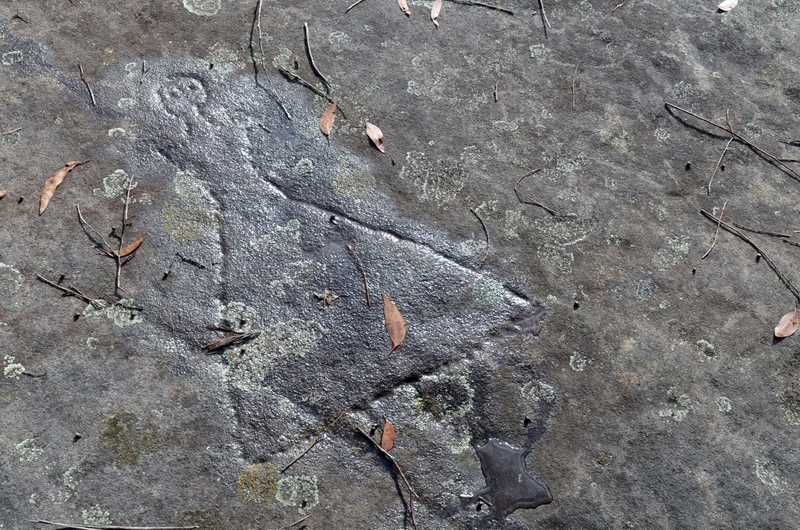 If you did not have the chance to watch ‘The Secret River’ on ABC TV recently – I would highly recommend this as a confronting and insightful historical fiction of early settlement and Darug Aboriginal cultures on the Hawkesbury River. It is based on a book by Kate Grenville which is a must read also. I think these sites are as significant to the world as Stonehenge or the Pyramids, but it is a sad reflection on our country that they are mostly forgotten and lost to all but a few of the community. Maybe it is for the best – they are less prone to vandalism and tourism the way they are. They will gradually erode and fade away. The Darug culture will not – thanks to custodians like Erin and the Darug community who are educating us all of these traditions. We hope students who took part in our program take pride in their culture and value themselves as custodians of culture into the future. 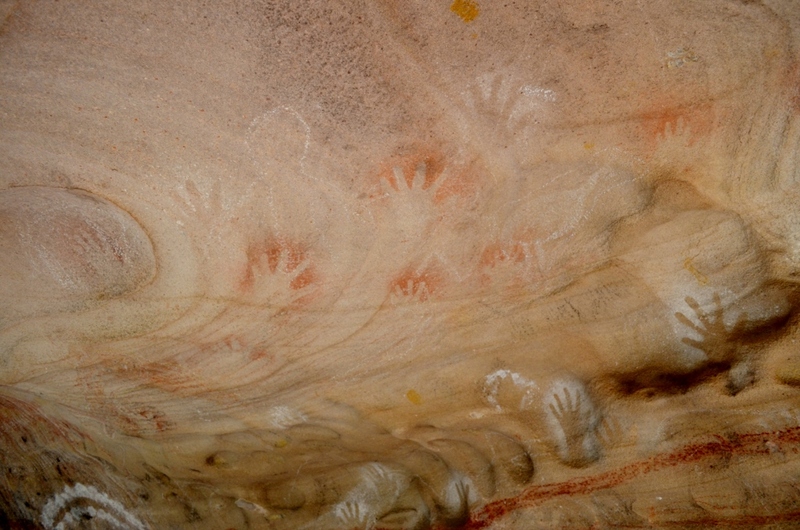 Listen to Uncle Wes Marne tell a story of the Rainbow Serpent at the Canoelands cave site. 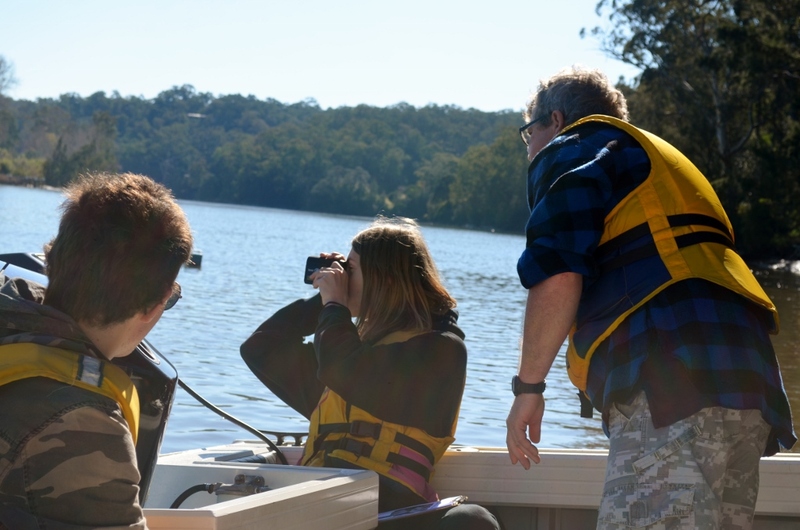 Imagine if trees in the Sydney basin were humans and we could age group them into babies, infants, children, teenagers, young adults and so on. What would be the age demographic near you? Here at Brewongle we have some teenagers, young adults and a smattering of adults, but very few grandparents. These thoughts entered my head today via an arborist who gave me pause to consider the different time scale that trees live by. In a human lifetime, a eucalypt tree may only just be entering young adulthood. We humans have successfully removed most of the grand old gnarly, hollow bearing, life giving, shady, deep rooted, beautiful, wise trees from our parks, bushland, backyards and reserves. They have become mulch, firewood, houses and are often removed as ‘dangerous’. They are now nothing but a shadow in an earthly memory. Many of us will never live to see our current trees grow to a grand old age where limbs are sagging and the tree has become a hotel for literally millions of living things. So where are my wistful ramblings leading you ask? Well, I do have a point….. and that is that due to our propensity for chopping trees, we are severely lacking in habitat spaces for many of our tree hollow loving native critters (over 300 species need hollows). Question is, what can we do about it? – especially in a highly urbanised city like Sydney? One immediate answer is to build replacement habitat. 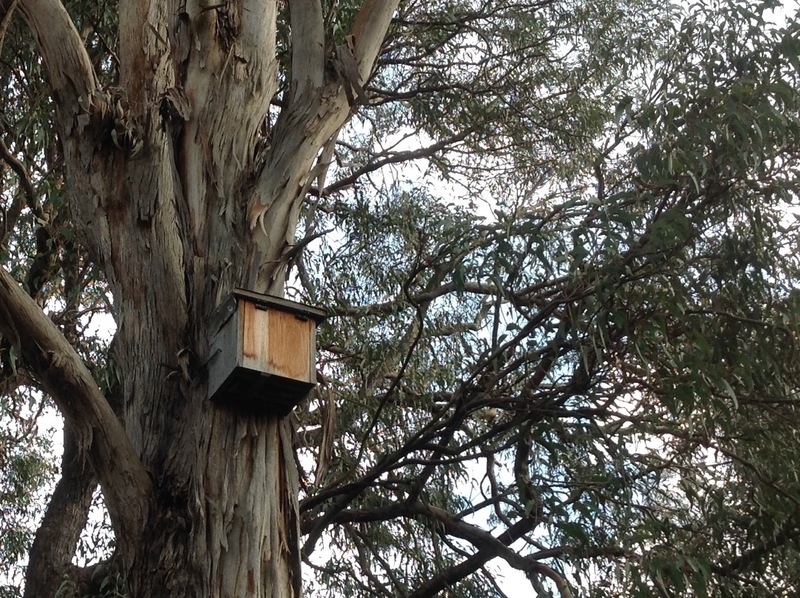 We are a hasty species compared to trees and other homeless creatures don’t have the time to wait for trees to form hollows on their own (100 yrs or more), so we can augment young trees with nest boxes and other homely developments for our furry and feathery friends. Do you target a threatened, or common species? Is there food sources for your target species nearby? How will you attach it to the tree without causing undue damage and allowing for tree growth? How high on the tree? What aspect will it be facing? How will you monitor who takes up your ‘for lease’ ad in the local wildlife gazette? As ‘nestboxing’ (my term) seems to be an emerging science, many of these questions may be answered by trial and error. Here is some things I learned today. It may take a while for animals to take up your lease and move in on any sort of permanent basis. Be patient. Marine ply boxes do not last long. Lid failure is a major issue. 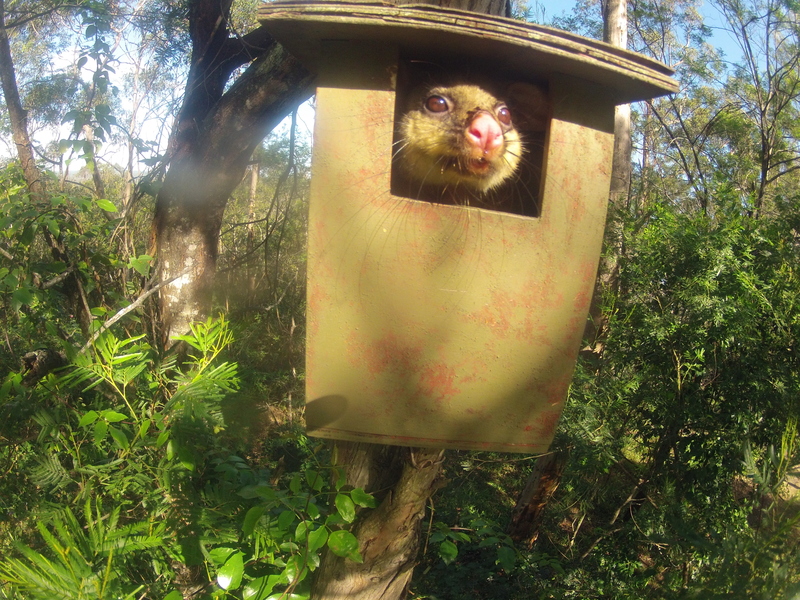 Openings facing the trunk reduce the chance of bees and possums excluding your desired species. providing bedding material (ie peat moss or dry mulch) and a ‘ladder’ (ie grooves in face plate) near entrance and inside will make it more attractive to prospective tenants. A hinged lid makes for easier monitoring. Rubber hinges can replace metal that will rust. Using strapping and tech screws to attach to the trunk will cause stress to the tree and will not last long. Two suggested attachment methods – wire around trunk with protective outer plastic coating (ie garden hose) and ziz zags in the wire to allow for stretching as tree grows. 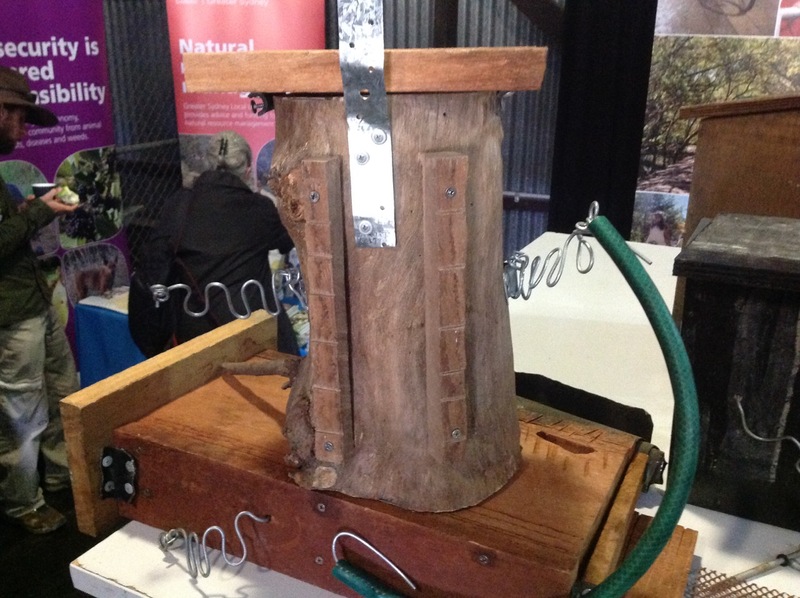 2nd method suggested by arborists – drill right through the trunk and attach with a large bolt and nut. 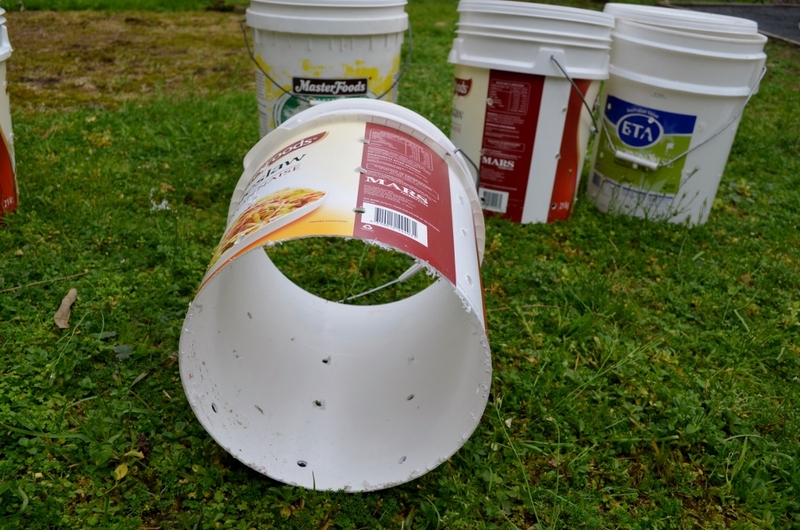 Avoid paint near entrance hole as many animals will chew on this. PVC boxes are lightweight, cheap and easy to install but are poorly insulated and will not withstand fire! 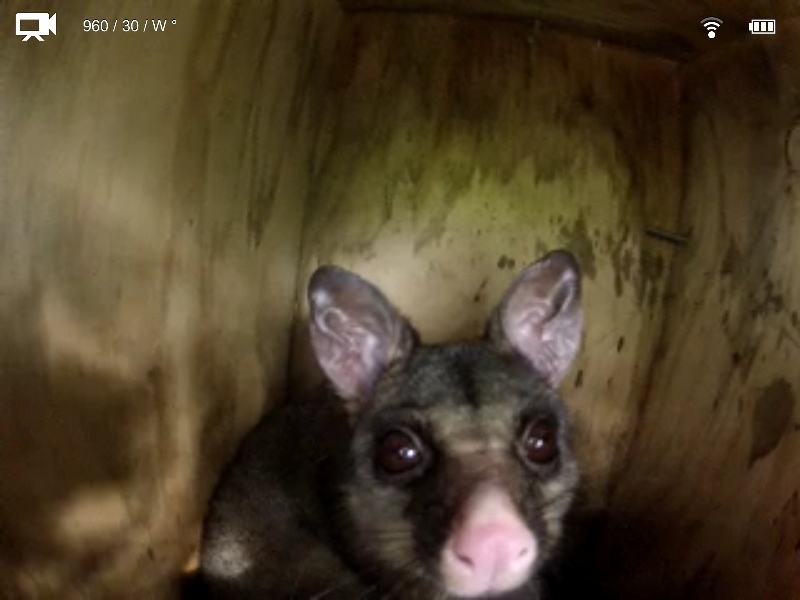 Design your box for your species – there are now plenty of successful designs out there. Ask for help from local council or other agencies. Monitor how well it works! 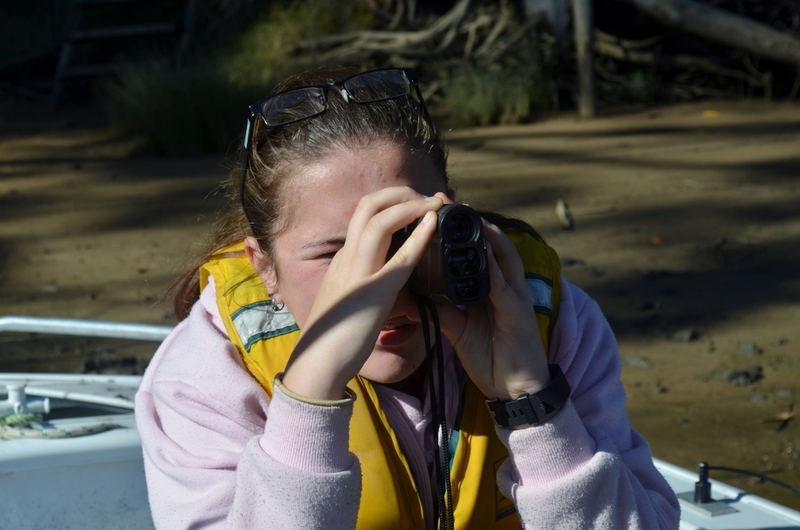 Use cameras, manual observations to discover species use. 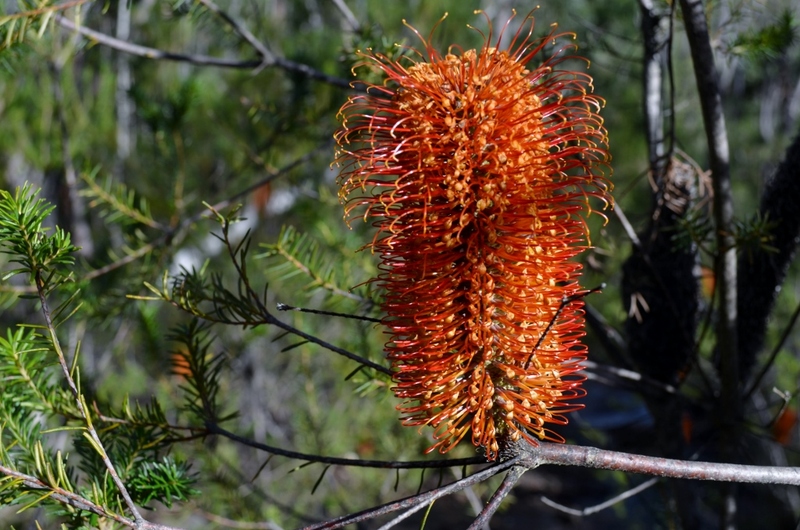 Data can easily be uploaded to the Atlas of Living Australia website so it benefits us all! They can help with species ID too. Think of ground hollows, aquatic hollows and perches and other coarse woody material on your site. It was inspiring to hear of many councils who are attempting to retain dead trees and ‘dangerous’ trees in the landscape and augment them with artificial, chainsaw made hollows. This was really interesting and is also a way to speed up the decay process that makes hollows. 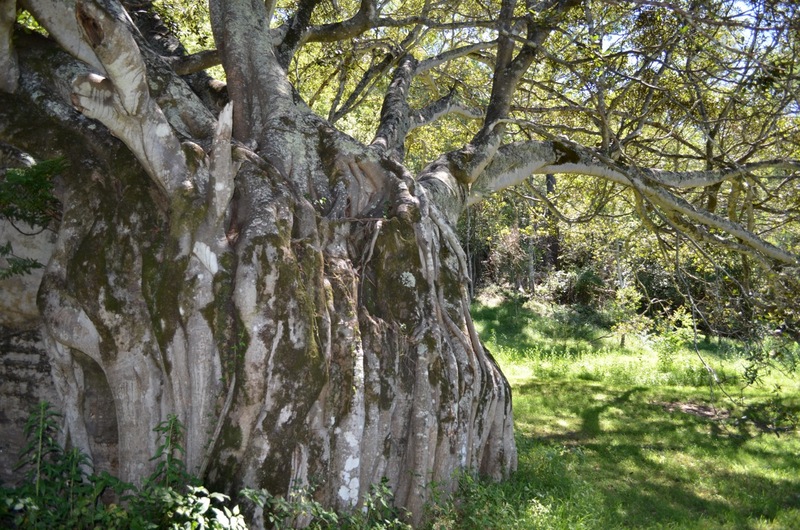 A dead tree may be pruned, then artificial hollows created by an arborist. We had a demonstration by a very skilled arborist on a cut stump.